Dog-friendly? Yes we are. Please vote for us. The Geese and Fountain has been nominated for the Dog Buddy ‘Dog-friendly Pub Awards’. We’re very grateful to our customers who have nominated us. You may have seen a little mention in this week’s Grantham Journal about that. We think we’re a very friendly pub – for people, dogs, cats, horses and pretty much any mammal who needs a drink. We welcome dogs around the pub on the same basis as we welcome people – we expect them to keep their voice down, avoid upsetting our other customers and not sit on the tables. We have water bowls and dog treats at the bar, doggy B&B facilities and a lovely garden. You’re welcome to bring your dogs whether you’re having a drink, a meal or are staying with us. And we’re in the middle of some amazing countryside for walks. Posted on September 26, 2016 Leave a comment on Dog-friendly? Yes we are. Please vote for us. Meet The Brewer tonight – with pizza! As part of our Cask Ale Week celebrations, tonight (Monday, September 26th) at 8pm we’re hosting a Meet The Brewer event with Tim and Kathy Britton from Oldershaw Brewery. One of our closest breweries, Oldershaw have a delicious array of ales, many with traditional local recipes at their heart. From the dark and delicious Grantham Porter, through traditional tasting Barkston Bitter to the award-winning American Hopquad, Oldershaw’s beers are a regular sight on our bar and in our bottle fridge. Come down and meet the brains behind the brew, try a few beers and chat about beer. As it’s a special event, we will supplement our regular menu with a range of delicious pizza to complement the beers. Pizzas available to order from 6pm. Meet The Brewer event starts at 8. Posted on September 26, 2016 Leave a comment on Meet The Brewer tonight – with pizza! 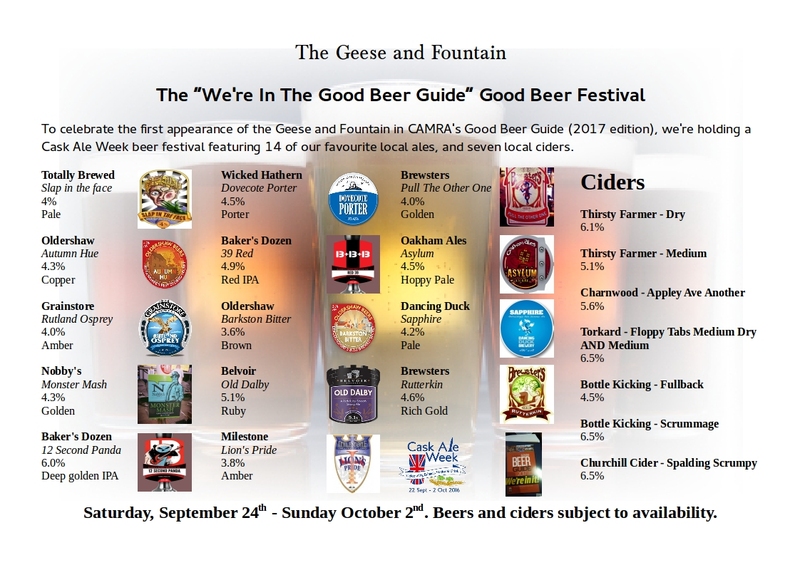 To celebrate the Geese and Fountain appearing in CAMRA’s Good Beer Guide for the very first time, we are holding a Local Beer Festival during Cask Ale Week, from Saturday 24th September until Sunday 2nd October 2016. Fourteen local ales and seven local ciders will feature during the week, and two special ‘Meet The Brewer’ events are also being held on Monday, 26th September and Saturday, 1st October. Good Beer – It’s Official! 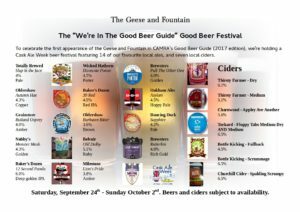 The Geese and Fountain is thrilled to announce that it has been listed in the 2017 edition of the Good Beer Guide, produced by CAMRA – the Campaign for Real Ale. It’s the first time the Croxton Kerrial pub has appeared in the Good Beer Guide, and comes barely a year after it re-opened with new licensees and a new name, after three years lying closed and empty under its old name of ‘The Peacock Inn’. The Guide features only the best in real ale-serving pubs, and the Geese and Fountain has quickly established itself as a special feature on the local real ale circuit: offering a unique selection of locally brewed real ales, ciders and lagers, along with new beers on tap from breweries such as Totally Brewed in Nottingham, Amber Ales in Derbyshire, and Brewsters in Grantham. Not only that, but the pub also offers delicious local food, over 100 different beers and ciders in bottles and cans, a fully organic wine list featuring over 30 different and distinctive varieties, and unusual spirits and liqueurs, including some distilled only a few miles from the pub. Licensee at the Geese and Fountain, Nick Holden, said, “We’d all like to thank those CAMRA members who have voted for us to be included in the Guide. It’s a great honour and we’re very excited to have our hard work over our first year recognised in this way. We’re really looking forward to our second year, when we’ll have even more amazing beers on sale, and lots of beer-related events to keep people entertained and enjoying beer. “Since the Geese and Fountain opened in Croxton Kerrial last August, we’ve served nearly 200 different real ales, all sourced from local breweries such as Oldershaws, Belvoir Brewery and Grainstore. We love finding quality new beers and sharing them with our customers, and hopefully it’s that spirit of excitement about beer, and the friendly atmosphere we try to create in the pub, that has led to us being included in the Guide. The pub is celebrating in the only way they know how – with a beer festival. They’ll be serving double their usual number of local ales during Cask Ale Week, which is a national celebration of Real Ale, between September 23rd and October 2nd. There will also be two ‘Meet The Brewer’ events – with Oldershaw Brewery on Monday, September 26th and with Brewsters Brewery on Saturday, October 1st. Posted on September 23, 2016 Leave a comment on Good Beer – It’s Official!